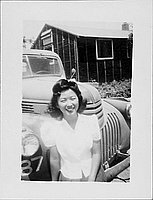 Portrait of a smiling young woman in white blouse standing in front of fender of truck at Rohwer concentration camp, Rohwer, Arkansas, 1942-1945. Number "87" visible below headlight at BLC. Barracks partially visible in background TR.